Matthew is currently a Senior GIS Analyst for the Arkansas GIS Office. 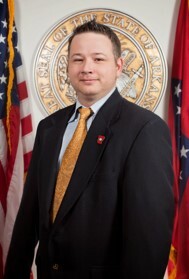 Matthew began contracting for the Arkansas GIS Office in 2011 after serving nine years as an Intelligence Analyst in the United States Air Force. Matthew began his career at Hurlburt Field, FL where he provided Air Force Special Operations Command (AFSOC) aircrews training, mission planning support, and enemy threat analysis utilizing several Geographic Information Systems (GIS) oriented applications. Matthew moved on to the 4th Air Support Operations Squadron (4 ASOS) located in Mannheim, Germany where he continued to provide Intelligence and GIS related support to the unit in the execution of its mission. Matthew has deployed numerous times serving in the campaigns of both Operation Iraqi Freedom and Operation Enduring Freedom. In May, 2011, he received an Honorable Discharge from the USAF with the intent of completing school and beginning Information Technology/GIS related career. He is currently attending American Military University via distance learning in pursuit of an Information Technology Management Baccalaureate. In Matthew’s current capacity his responsibilities include address point processing and production quality control as the Address Theme Lead. Secondarily, Matthew is the agency lead for USPS County Project, which focuses on improving data quality for both USPS and the numerous address authorities throughout the State of Arkansas. In his off time Matthew enjoys playing sports, hiking, and spending time with his children.